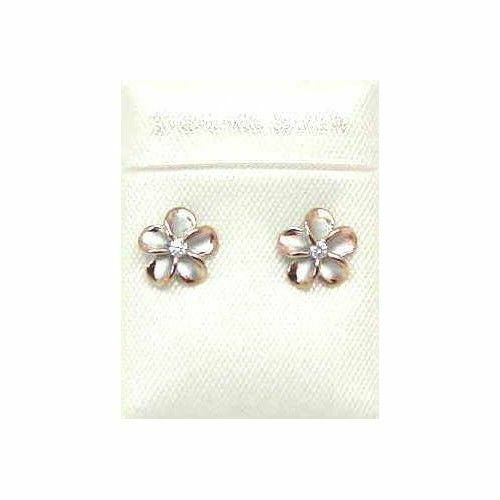 Flower size: 8mm (approx. 5/16"). Petal: brush finish. Weight: approx. 0.9 gram. Stone: white/clear Cubic Zirconia (CZ). Stamp: 925. 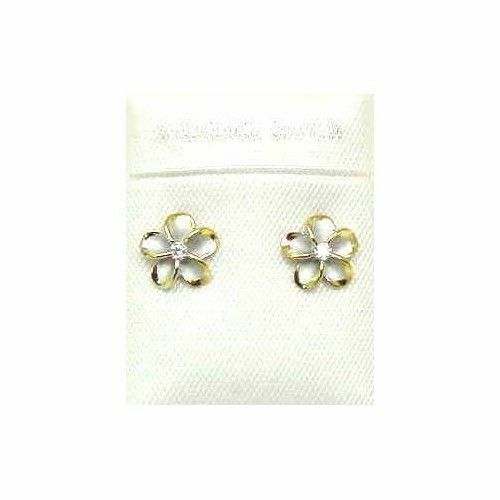 Flower size: 8mm (approx. 5/16"). Petal: brush finish. Weight: approx. 0.9 gram. Stamp: 925. Stone: pink Cubic Zirconia (CZ). Flower size: 8mm (approx. 5/16"). Petal: brush finish with yellow gold plated edge. Weight: approx. 0.9 gram. Stamp: 925. Stone: clear Cubic Zirconia (CZ). 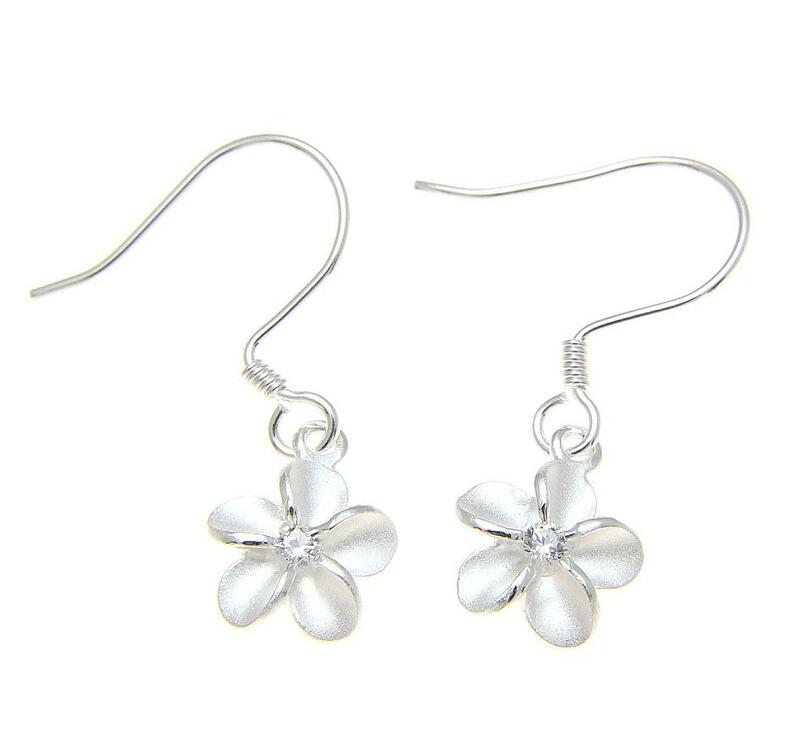 Flower size: 10mm (approx. 3/8"). Petal: high polish. Weight: approx. 1.1 gram. Stone: white/clear Cubic Zirconia (CZ). Stamp: 925. 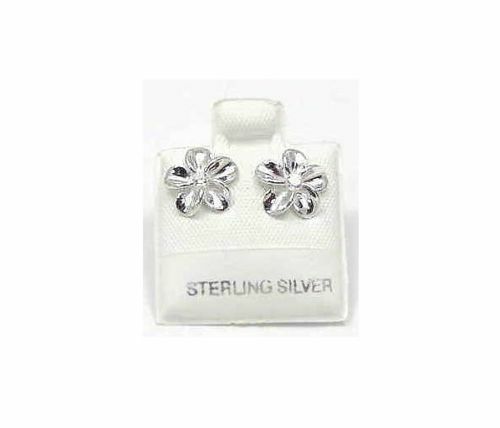 Flower size: 10mm (approx. 3/8"). Petal: high polish with yellow gold plated edge. Weight: approx. 1.1 gram. Stone: white/clear Cubic Zirconia (CZ). Stamp: 925. 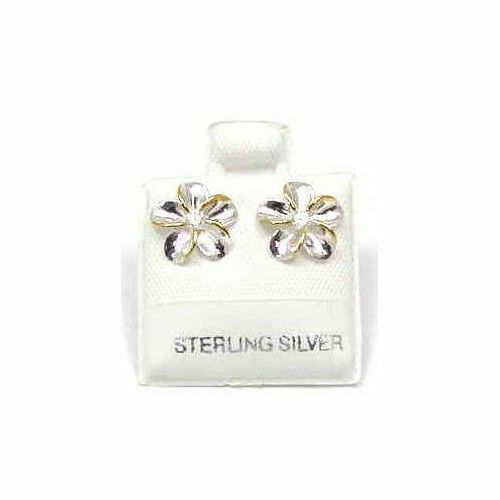 Brand new solid 925 sterling silver Hawaiian fancy Plumeria flower earrings. Flower size: 8mm (5/16") in diameter. Petal design: polish edge around brush finish. Weight: approx. 0.8 gram. Stone: clear Cubic Zirconia (CZ). Stamp: 925. Rhodium finish: white gold look. 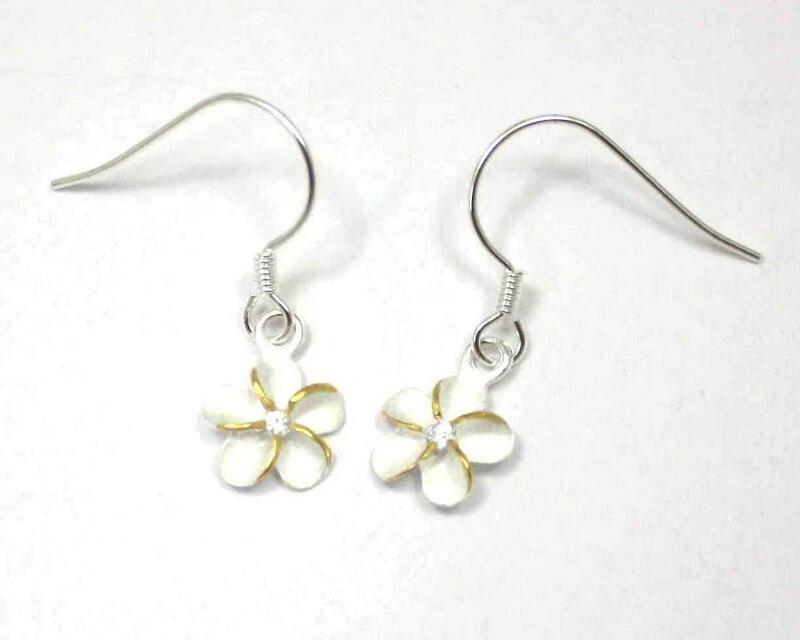 Brand new solid sterling silver Hawaiian fancy Plumeria flower earrings dangling on wire. Flower size: 8mm (5/16") in diameter. Petal design: pink/rose gold plated edge around brush finish. Weight: approx. 0.9 gram. Stone: Cubic Zirconia (CZ). 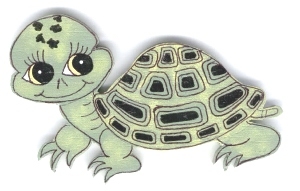 Stamp: 925. Rhodium finish: white gold with rose gold look. 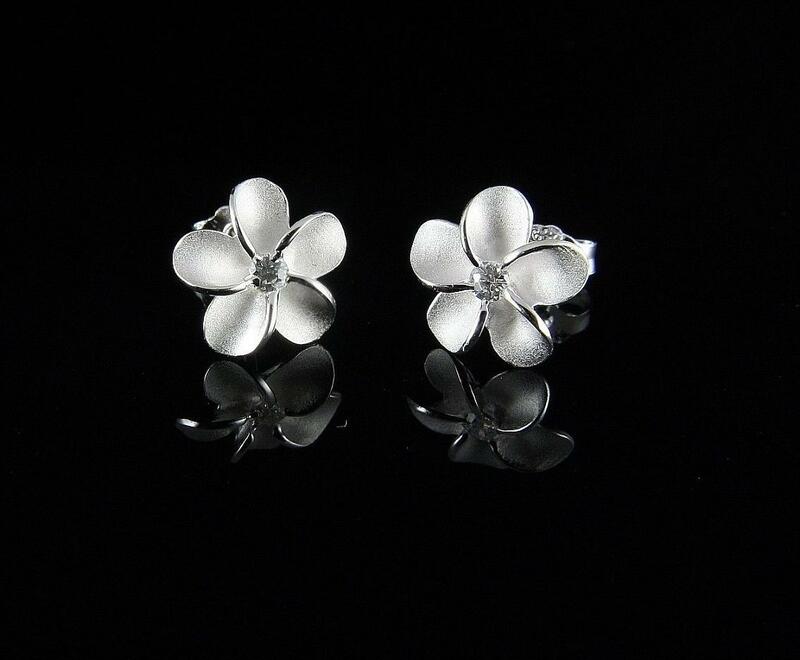 Flower size: 10mm (approx. 3/8"). Petal: brush finish with yellow gold plated edge. Stone: clear Cubic Zirconia (CZ). Weight: approx. 1.4 gram. Stamp: 925. Flower size: 10mm (approx. 3/8"). Petal: brush finish. Weight: approx. 1.3 gram. Stamp: 925. Stone: pink Cubic Zirconia (CZ). Flower size: 10mm (approx. 3/8"). Petal: brush finish. Weight: approx. 1.3 gram. Stone: white/clear Cubic Zirconia (CZ). Stamp: 925. 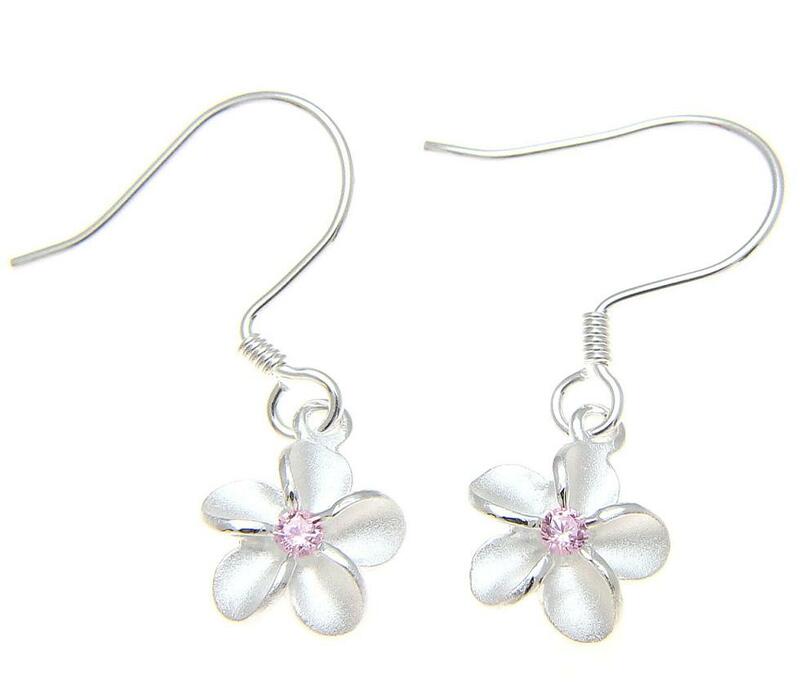 Flower size: 10mm (approx. 3/8"). Petal: brush finish. Stone: pink Cubic Zirconia (CZ). Weight: approx. 1.4 gram. Stamp: 925. 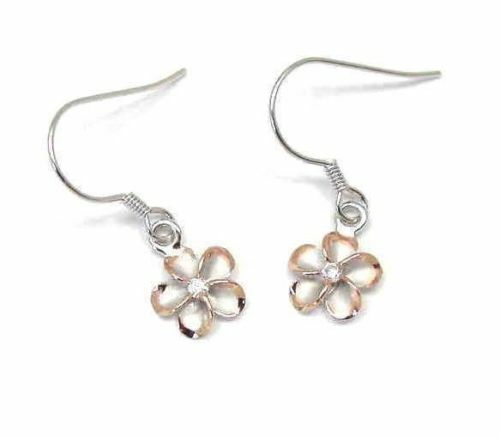 Flower size: 10mm (approx. 3/8"). Petal: brush finish. Weight: approx. 1.4 gram. Stone: white/clear Cubic Zirconia (CZ). Stamp: 925. 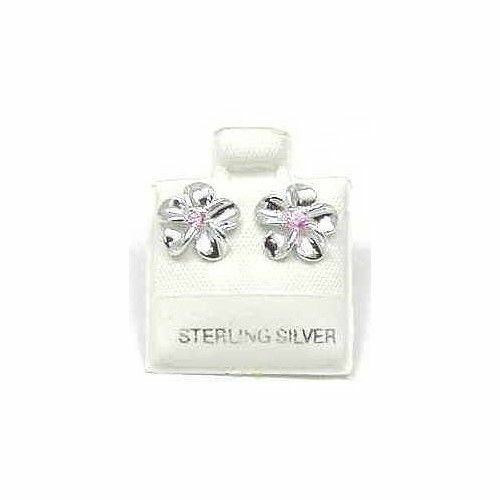 Brand new solid 925 sterling silver Hawaiian fancy Plumeria flower earrings. Flower size: 8mm (5/16") in diameter. Petal design: yellow gold plated edge around brush finish. Weight: approx. 0.8 gram. Stone: Cubic Zirconia (CZ). Stamp: 925. Rhodium finish: white gold with yellow gold look. 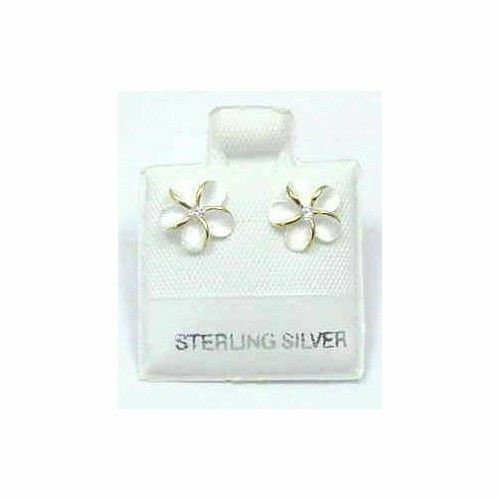 Brand new solid 925 sterling silver Hawaiian fancy Plumeria flower earrings. Flower size: 8mm (5/16") in diameter. Petal design: pink/rose gold plated edge around brush finish. Weight: approx. 0.8 gram. Stone: (CZ). Stamp: 925. Rhodium finish: white gold with rose gold look. 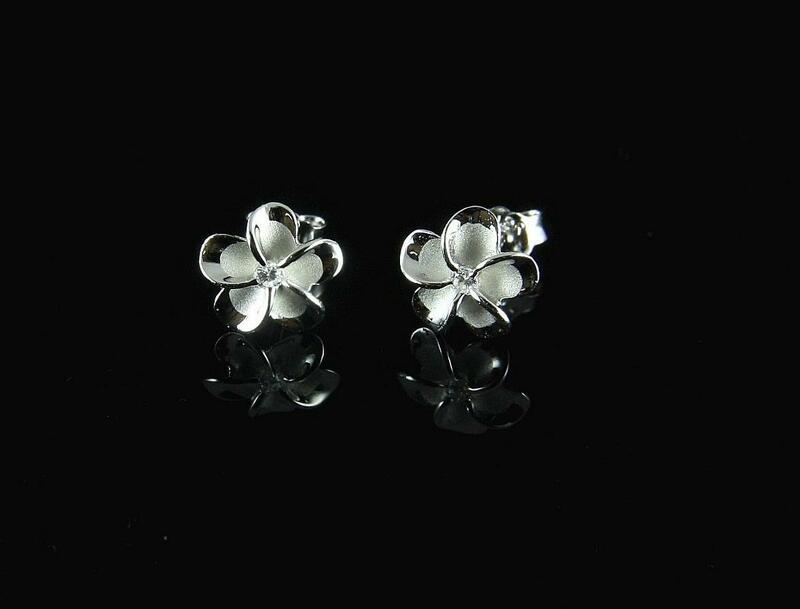 Flower size: 10mm (approx. 3/8"). Petal: high polish. Weight: approx. 1.1 gram. Stone: pink Cubic Zirconia (CZ). Stamp: 925.